Two of the worlds premier research aircraft, the renowned NOAA WP-3D Orions, participate in a wide variety of national and international meteorological, oceanographic and environmental research programs in addition to their widely known use in hurricane research and reconnaissance. Data collected during hurricanes by these airborne meteorological platforms are fed into numerical computer models to provide better forecasts of how intense a hurricane will be, and when and where it will make landfall. These data fulfill two important purposes: to help forecasters make accurate predictions during a hurricane; and to help NOAA researchers achieve a better understanding of storm processes. Slicing through the eye wall of a hurricane, buffeted by howling winds, blinding rain, violent updrafts and downdrafts before entering the relative calm of the storms eye, NOAAs two Lockheed WP-3D Orion turboprop aircraft probe the very nature of the storm, repeating the grueling experience a number of times during the course of a 9-10 hour mission. In support of scientists from NOAAs Office of Oceanic and Atmospheric Research, Hurricane Research Division, crew members deploy instruments called GPS (Global Positioning System) dropwindsondes as the WP-3D Orion aircraft penetrates the hurricane. These devices continuously radio back measurements of pressure, humidity, temperature and wind as they fall toward the sea, providing a detailed look at the structure of the hurricane and its intensity. 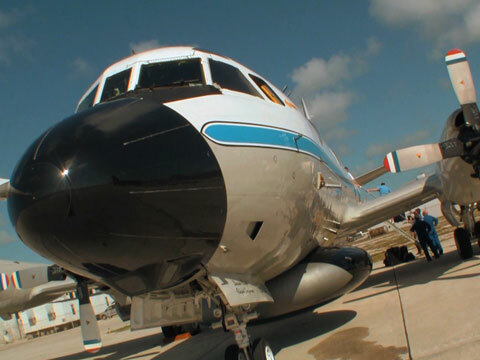 The hurricane awareness tour has been conducted for more than 25 years, alternating between the Gulf and Atlantic coasts, used to focus light on NOAAs hurricane hazard education campaign during national Hurricane Preparedness Week, May 24 to 30. The Atlantic hurricane season runs from June 1 through November 30th.